You don’t see many of these homes for sale. 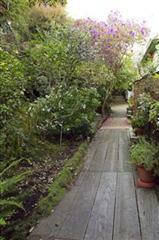 Located near Coit Tower, 15 Napier Lane is on a wooden sidewalk accessed only by the Filbert Street Steps. 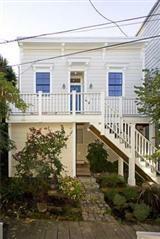 Very ‘Tales of the City’ location, and beautifully remodeled. For character, you can hear (and see) the wild Parrots of Telegraph Hill right outside your door. Accessing the property, you can imagine how it must have been in old San Francisco, coming home from a Barbary Coast Saloon. The listing states that the home was built in 1884. Two bedrooms, two baths and a wonderful garden accessed from both floors. There is a wonderful sun room that would make a terrific office. Listed at $1,295,000. Given it’s location, obviously, no parking. The good news, is that you can give up your gym membership. Available by appointment. After four months on the market, the home was reduced to $1,230,000. It’s been a month since that change and still no takers. Could it be the stairs?